Fulham’s away record in London derbies in the Premier League era is woefully bad: they have won just four out of 50, and not one of those at Arsenal, where they play this weekend. 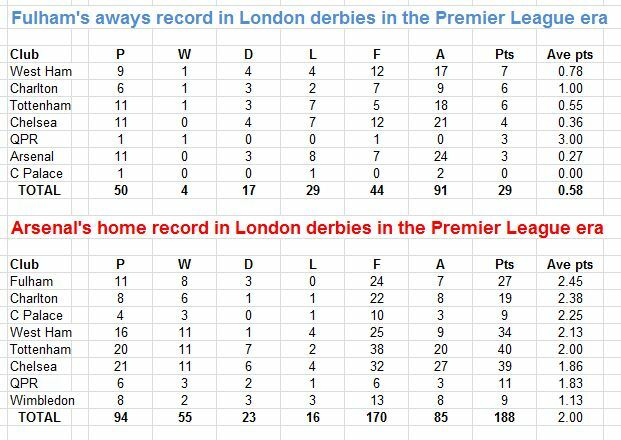 Fulham, incidentally, are the only London club against whom Arsenal have an unbeaten home record in derbies in the Premier League. The Gunners have hosted Fulham 11 times to date in the era, winning eight and drawing three. As our graphic shows, Arsenal have averaged two points per game from 94 all-London games on their own turf, but have won more points per game against Fulham than against anyone else. Hence this weekend’s match is a chance for Fulham to break new ground, but also a game in which Arsenal fans, should they lose, might truly start to argue they are reaching a new low under Arsene Wenger. Only seven teams in the 20 complete season of the Premier League football have gone as many as 10 games from the start of a season without recording their first win. 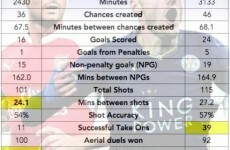 QPR are now the eight side to reach this unwanted statistical landmark and unless Reading beat Norwich on Saturday they will become the ninth side. But all is not yet lost for these winless teams. 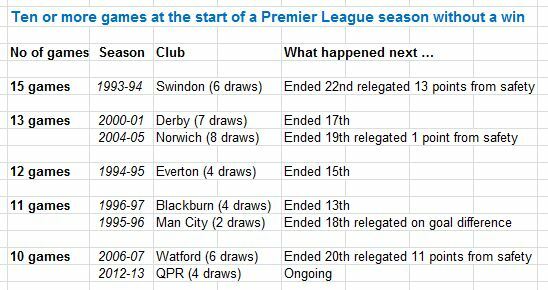 Of those seven sides in the previous 20 seasons, three of them went on to avoid relegation, as our graphic below shows. And even of those eventually relegated, there were some close run things: in 1995-96, Manchester City were only relegated by goal difference and as recently as 2004-05 one extra point could have saved Norwich. 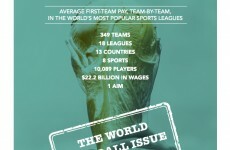 Next article What's wrong with English football? Nominate the worst owners. And the best.